To conclude our survey of Martha Sigall’s “Tales from Termite Terrace and Other Tooneries”, we present a video interview with ink and paint artist Joan Tipper Pabian and her husband, animator Albert Pabian from November 20th, 1998. Both started in animation in 1937 through the help of relatives: Joan at Lantz via cousin Frank Tipper and Al at Harman-Ising, as an inbetweener, with the aid of his brothers, Jim and Tony Pabian (background on brothers Jim and Tony Pabian here). They soon met and were married in 1939. Joan had been considering a career as a dressmaker, while Al didn’t have many job prospects back in Rochester, NY, other than possibly working at Eastman Kodak. Joan recalls how Disney’s hiring frenzy to finish Snow White in 1937 created a job opening at Lantz, which she was alerted to. Al’s stay at Harman-Ising was cut short when MGM set up their own cartoon studio, so he decided to take a job at Lantz instead of joining the new studio. 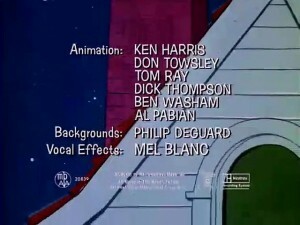 There, animator George Nicholas requested that Al become his assistant. He also talks about Lantz’s practice of finishing his full yearly complement of 26 cartoons way ahead of schedule, enabling him to close down the studio while he took a vacation in the Bahamas; on the plus side, Al recalls being able to wander around the Universal lot and see various movies being shot. Joan recalls both picked up extra money by doing odd film gigs during their lunch hours: for example, Al got $5.00 for providing a scream for Destry Rides Again (1939), while she was a leg double for Mae West and a hand double for Irene Dunne. Al moved over to Schlesinger’s, first at Raymond Katz’s “studio” before the two were consolidated after the company was unionized. When the war came, he was turned down by the Coast Guard, then drafted by the Army. He was posted to the First Motion Picture Unit in Manhattan, which was later merged with its more famous incarnation in Culver City. The vacancies caused by the war allowed Joan to work on backgrounds at Schlesinger before she decided to join Al in New York as a civilian employee. 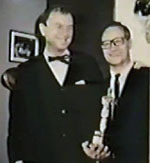 After the war, he returned to Warner Bros., becoming Ken Harris’ assistant before going off into the world of TV commercials. He tells how he was working for John Hubley’s L.A. studio, when Hubley decided to close it down to devote all his attention to his New York operation; instead of selling it off, he essentially gave the facility, including equipment, to the artists; the new studio became Quartet Films, which became a major commercial house. Both also talk about their happy experiences working for Bill Melendez. For her part, Joan briefly worked in dressmaking after the war, before getting a job at Screen Gems—mainly because ink and paint work paid more than making expensive dresses for Hollywood celebrities. She eventually ended up at Hanna-Barbera, telling tales of some of the chaos caused when the company seemed to hire people off the street to fulfill the demands for cel painters. She also tells of her Filipino-born daughter-in-law’s experience when Hanna-Barbera sent her to Manila to supervise ink and paint work at Fil-Cartoons (when it was run by Jerry Smith); this included the minimal piece work rates Smith paid to keep its overstaffed studio busy, rather than pay them a salary. She also muses on the problems most studios had, in the days before air conditioning, with paint sticking to cels during hot weather—something Disney had overcome with a specially formulated paint. The tape concludes with a brief sampling of personal photos of the two made during the ‘30s and ‘40s. Incidentally, which Warner cartoons did Al Pabian worked on? Unless I misheard, Joan Pabian said Frank Tipper was her brother, not cousin (1930 census records bear this out), while Al Pabian said Jim and Tony were his cousins, not brothers, as per the first paragraph of this story. Wow, this was perhaps the best of the lot of interviews as the parties involved here seem to remember so much great detail, including the ink and paint ladies. If Al or Joan came to MGM in, say, 1937, I’d be curious as to which cartoons they were put to work on. 1937 was a particularly good year, although it perhaps helped to sever ties between Harman/Ising Studios and MGM. I loved the stories about the Philippine woman who worked for Hanna-Barbera Productions and helped control work on both coasts–so many amazing impressions of what it took to make the classic cartoons that we enjoy. I never knew that the cells on which the drawings were drawn and inked were also nitrate! Thanks for this series. Some of this should end up on commentaries if the industry ever goes back to realizing that releasing classic cartoons to DVD or blu-ray is very, very important. 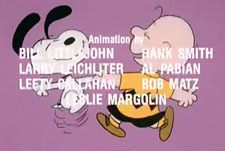 Al Pabian did not retire until 2003 (His last credit was “I want a Dog for Christmas Charlie Brown”). This was impressive considering that many other of those workers would have been long dead or retired. Pabian died in 2015 and has lived through animation in various stages and has lived to see Flash Animation, and Digital Ink And Paint which was unimaginable in 1937 or even 1972. 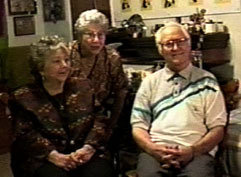 Al and Joan remained married until her passing in 2001. Al Pabian did not get screen credit until 1966 and Joan did not get screen credit until 1980.